With its luminous sheen and wide array of color and karat options, it's no wonder that gold is a popular choice for engagement rings. If you're considering this precious metal for your jewelry, it's important to understand the basics about the characteristics, care, pricing, and styles of gold engagement rings. While most precious metals, like platinum or sterling silver, come in a single color and have a specific set purity requirement for jewelry, gold is full of options. By mixing gold with various other metals, jewelers produce rings in a variety of colors and at several affordable price points. On its own, gold is a very soft metal. In fact, according to the American Federation of Mineralogical Societies, pure gold rates at about 2.5 on the Mohs Scale of Hardness. This makes it softer than every other precious metal, and it means that almost any object you encounter in your daily life could damage your pure gold jewelry. Due to this softness, jewelers create alloys, or metal combinations, that make gold rings more durable. You may notice that gold rings are marked with a karat (k) value. This karat value tells you the purity of the gold, or how much actual gold is in the jewelry. Each karat is 1/24 of the gold item. It's important to understand this as you consider pricing and durability. 24k - This is 24/24 gold, or pure gold, and it's the softest and most expensive option for a ring. 18k - This is 18/24 gold, or about 75% gold and 25% other metals. It's more durable and less expensive than pure gold. 14k - This is 14/24 gold, or about 58% gold and 42% other metals. It's more durable and less costly than 18k and 24k gold. 10k - This is 10/24 gold, or about 42% gold and 58% other metals. It's one of the least expensive choices and is quite durable. Since jewelers frequently mix gold with other metals to improve its durability and lower its cost, this means consumers have a wide variety of color choices. The other metals used in the alloy, such as copper, nickel, silver, and zinc, lend a bit of their color to the finished piece. The type and amount of the other metals results in a specific color of gold, according to Blue Nile. You'll see gold jewelry, including engagement rings, in the following beautiful colors. Yellow gold - Pure gold, as well as gold alloys that contain copper and silver in set amounts, has this warm, classic hue. Yellow gold is a great choice for traditional diamond engagement rings, and it also looks lovely with yellow diamonds, sapphires, and other gems. White gold - White gold has a tone that is slightly warmer than platinum. It comes from combining gold with white metals like silver and nickel. 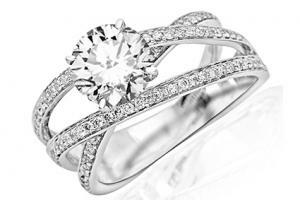 Often, white gold engagement rings feature rhodium plating to enhance their silvery sheen. White gold looks great with almost every gem, including diamonds. Rose gold - Rose gold is a lovely and non-traditional choice. This type of gold gets its soft, rosy glow from the addition of copper. It's a gorgeous choice for warm-tinted gems like rubies and pink sapphires, and it also looks lovely with diamonds. Gold is a classic, luxurious choice for your engagement ring, and it has many benefits. However, there are also a few potential drawbacks to this precious metal. Understanding the pros and cons of gold jewelry can help you make an informed decision. There are several reasons you may want to choose gold for your engagement ring. 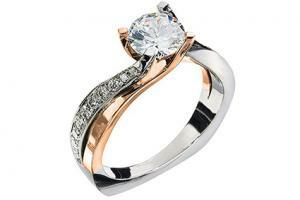 Cost - Compared to platinum, most gold engagement rings are more affordable. The price difference depends on a number of factors, including the purity of the gold, the manufacturer or brand name, and the amount of metal used in the setting. However, gold is almost always more cost-effective. Stability - Gold does not react with many other chemicals, so it's a great choice for jewelry you'll wear every day. It won't tarnish like silver or rust like iron. Design choices - Gold is extremely malleable, even as an alloy. This means that jewelers can work it into delicate designs with filigree, engraving, and other details. You'll find that gold rings tend to be more detailed than rings crafted from sterling silver and some other metals. Availability - Due to gold's long tradition as a jewelry metal, there are many gold engagement ring designs on the market. You'll see gold rings at your local jewelry store and online jewelers. Options - Available in different colors and at different price points, gold offers more options than any other precious metal. You can choose a lower purity level to accommodate your budget or select a specific color to compliment your favorite gem. While there are many benefits to choosing gold, there are also a couple of things to consider before you make a purchase. Durability - Although gold is very strong and doesn't tarnish, it's extremely soft. The higher the purity of the gold, the more likely it is to warp or bend when stressed. It can also scratch or dull with regular wear. Choosing 14k or 18k gold can help make your ring more durable. 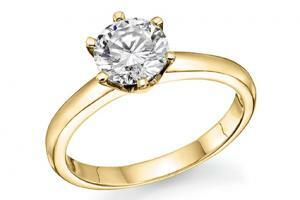 Allergies - While pure gold is hypoallergenic, very few engagement rings are made of 24k gold. People with metal allergies, particularly nickel allergies, need to use caution when choosing a gold engagement ring. If you're sensitive to a metal, make sure you know what is mixed with the gold in your jewelry. Looking for some inspiration in choosing a gold ring? Consider some of these spectacular options. A classic solitaire is the ideal choice for a traditional woman who wants a ring that will never go out of style. Available from Amazon.com, this diamond solitaire has it all. 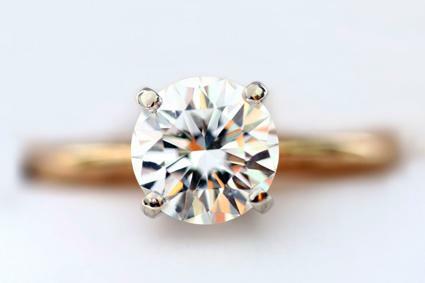 Set in 14k yellow gold, a 1/2 carat round cut diamond is simple and elegant. This ring comes in sizes four through nine and retails for about $630. For a unique choice, choose a ring with rose gold and a non-traditional gem. The Round-Cut Ara Ring from Gemvara is a beautiful option that features a six-millimeter, round-cut pink sapphire set atop a gleaming 14k rose gold band. 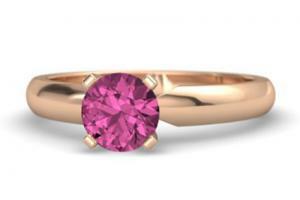 You can customize the ring with your choice of center gem if a pink sapphire isn't your style. It comes in sizes four through 10 and retails for just under $1,700. Gold can be classic, or it can be ultra-modern. If you love contemporary style, look for a gold ring with stunning lines and plenty of sparkle. The Twisting Split Shank Contemporary Ring from Amazon.com features a 0.8-carat, round-cut diamond in a spectacular asymmetrical setting with 0.5 carats of tiny diamonds. Available in your choice of 14k white, yellow, or rose gold, it comes in sizes four through 9.5. This ring retails for about $2,500. If you love vintage glamor, consider a gold ring that expresses your personal style. 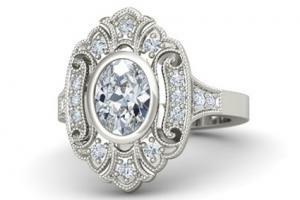 The Arya Ring from Gemvara is sure to turn heads with its delicate filigree and ornate setting. You can choose your favorite gem for the center, and you can select your favorite color of gold for the setting. This style comes in sizes four through 10. Cast in 14k white gold with an one-carat oval diamond, this ring retails for $5,200. You don't have to settle for a single tone of gold. Since this precious metal is available in different shades, it can be fun to combine two of them in your ring. The Diamond Halo Two-Tone Ring from Amazon.com features 14k white and rose gold intertwined in a band. The 0.5-carat, round-cut center diamond is accented with a row of tiny diamonds along the band. Available in sizes three through nine, it retails for about $1,700. Your gold engagement ring is designed to pass the test of time, but it's important to take a few steps to keep it looking lovely for years to come. Keep these tips in mind. Take off your ring when cleaning, gardening, or doing other work with your hands. This will keep the metal from getting scratched. To clean your ring, use a mild soap and water or a gold-approved jewelry cleaner. Don't use harsh chemicals. Have your ring inspected by a jeweler from time to time. Since gold is so malleable, the prongs and setting can loosen and result in lost gems. A quick check by a certified jeweler will keep your setting secure. If you aren't going to wear your ring for a while, store it in a separate box to keep it from getting scratched by other jewelry. If you're looking for a precious metal that's classic, beautiful, and offers a huge number of style options for your engagement ring, gold may be the ideal choice. Have fun perusing the options online and in your local jewelry stores. Your perfect gold ring is out there waiting for you.